Chengdus & Don'ts: And I thought China had a lot of people!!! We all had a great nights sleep and Gemma and I seem to be on the mend. 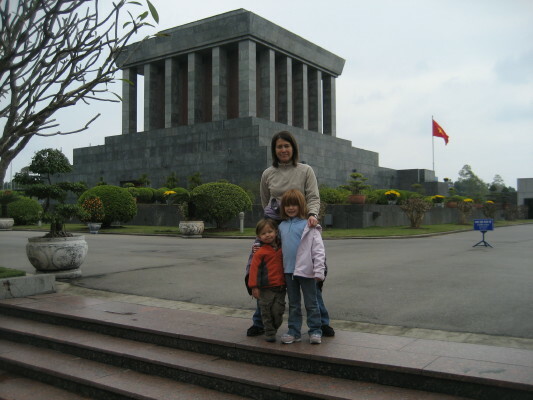 We decided we would have to hit the Ho Chin Minh Mausoleum to start our day off. 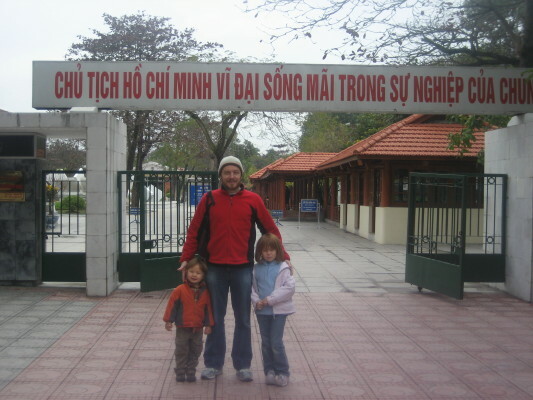 Jonny and the kids at the entrance of the mausoleum. It was kind of a freaky tour. We had to follow a path all the way to the mausoleum (as seen in the background of this picture), we couldn't step off the path or on the sidewalks. Jonny could not carry Angus in anyway. We all had to walk in a line. 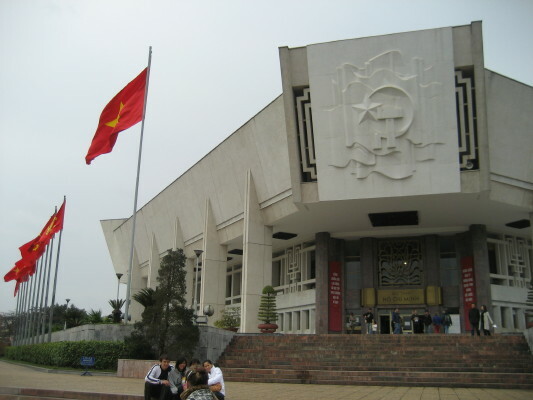 The mausoleum itself was pretty cool and "Uncle Ho" is what they refer to him in here, was preserved quite well. 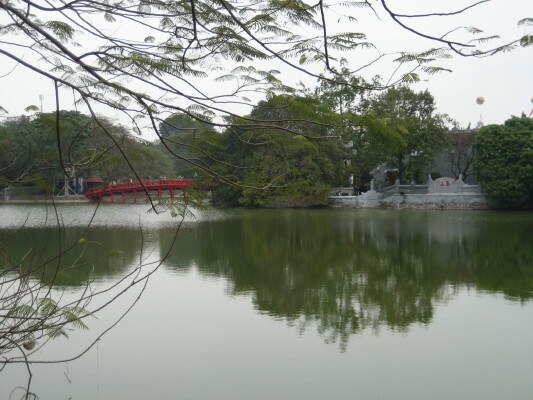 The mausoleum building was located in a large park area with some other sites to see. Here are a couple other things we saw in the complex. After the museum we tried to get a taxi, but they tried to rip us off. 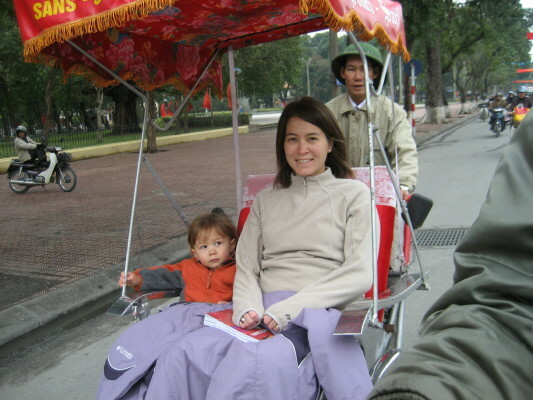 We started walking and decided to take our first cyclo ride. I had seen this type of transportation first at our favorite Vietnamese restaurant back in Chandler with the same name, but never dreamed I would actually be riding in one. 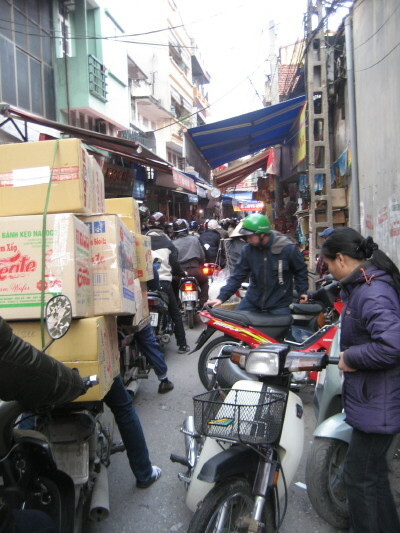 The thing that has really been different about being in Hanoi is the traffic. I honestly thought that you couldn't top traffic in China, but this is really the craziest thing I have ever seen. It is organized chaos at its best. 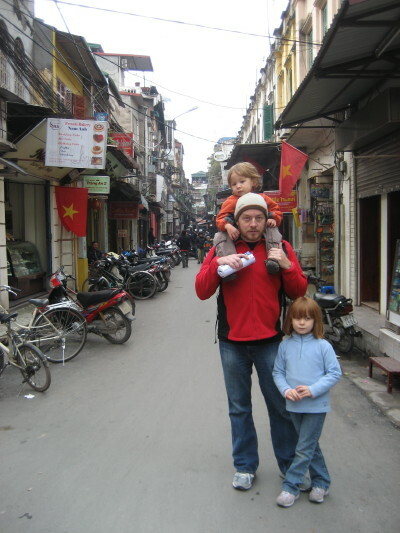 Here is a little video snip of our cyclo ride and the traffic of Hanoi. After our ride back to the hotel we decided to grab some lunch. 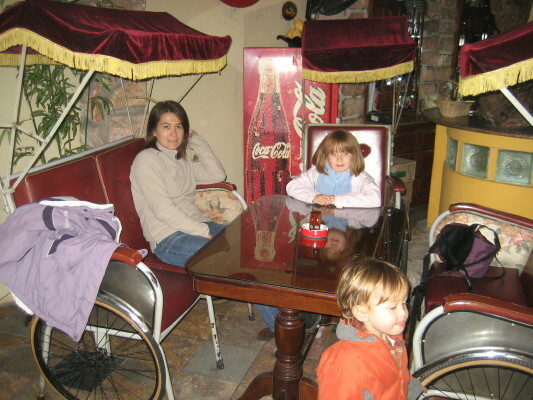 We went to a little place called Cyclo Bar and were pleasantly surprised to see the cyclo seat at our table. We had our first Vietnamese food of the trip and it was more than yummy! I had my first bowl of pho and some delicious spring rolls! We also had dessert and thanks to the French influence it was scrumptious! The kids were tired at lunch, so we headed back to the hotel for a little nap. Jonny went and scoped out the area for us and planned the rest of our day. 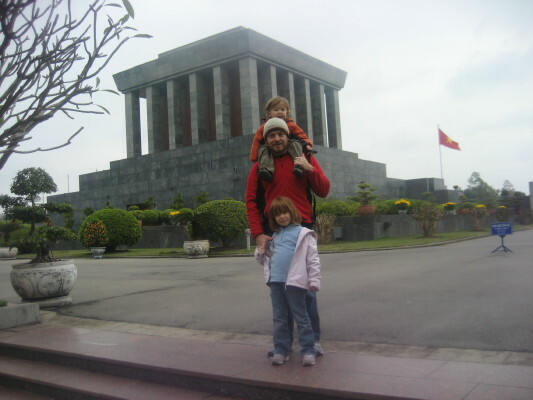 We woke the kids up and headed out to do a little walking tour of Hanoi. Here are some pictures of the tour. 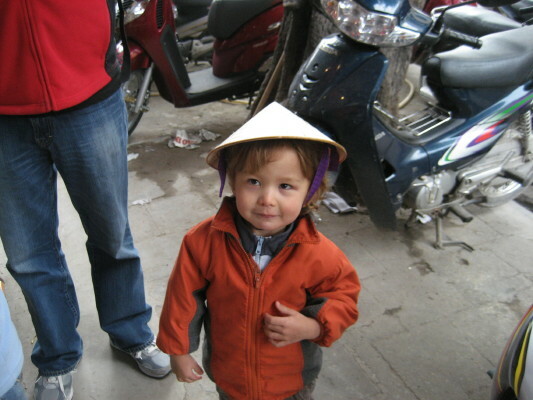 Angus sporting the famous conical hat. 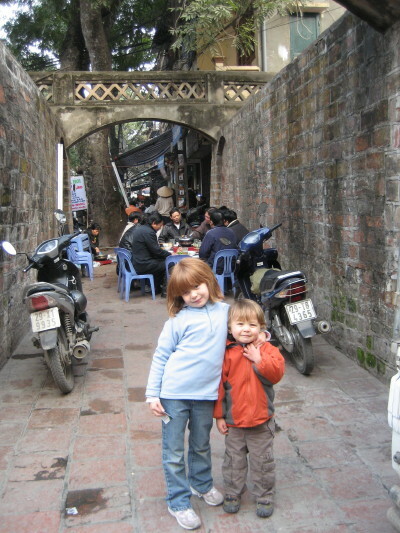 A typical alleyway in Hanoi. 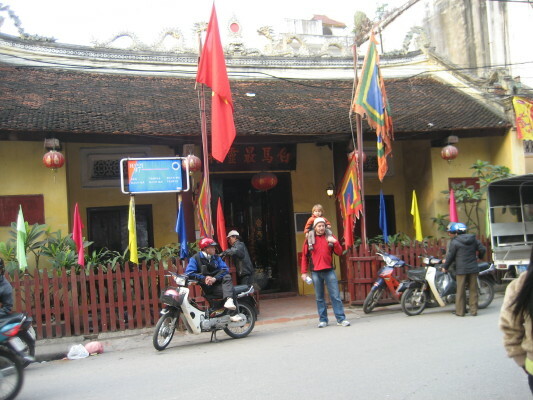 The old gate into Hanoi city. 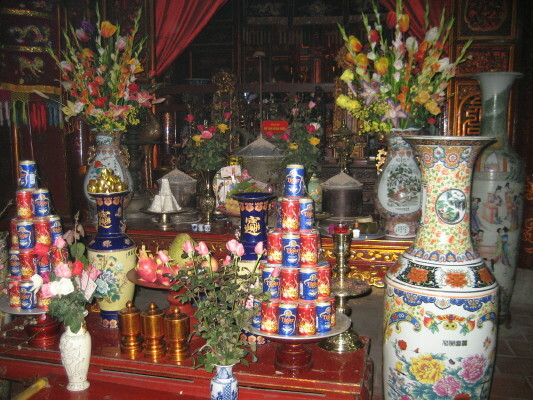 We loved the offerings to the gods, especially the Tiger beer! We made the mistake of walking down this street. It was literally standing room only. 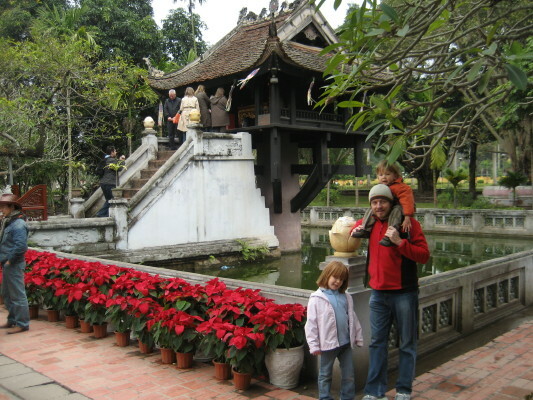 We had a very successful day and even though there was tons of traffic, I definitely thought we saw quite a bit of the Old Quarter of Vietnam. Tomorrow we are heading out to Halong Bay for couple of days. The kids are quite excited about it because we are taking an overnight cruise on a junk boat. It should be another adventure!